Hey guys. I’m back in Hong Kong after spending four weeks in Arizona for the holidays. During my last week there I got to visit two schools to talk about being a writer and then participated in a local book club’s discussion of Seabound! Full disclosure: it was my mom’s book club (she’s on the left with the stripes). 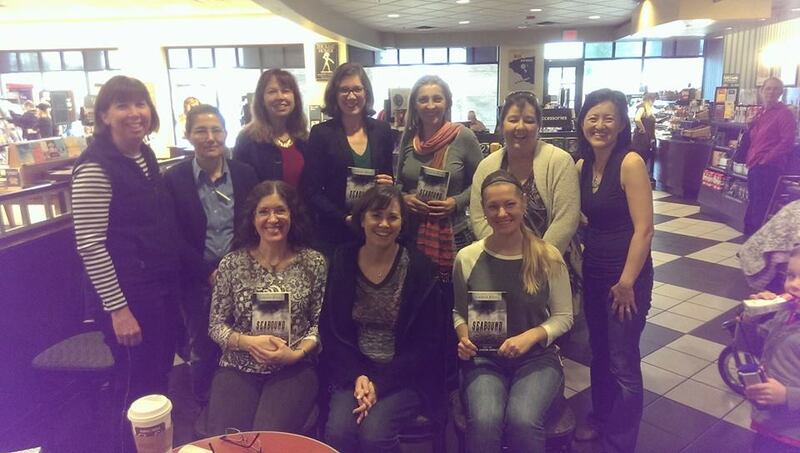 This was my first time attending a book club as the featured author–and it was pretty awesome. I had such a great time hearing the group’s thoughts about Seabound. We started off by going around and revealing whether we’d rather live on the Catalina or the Galaxy Flotilla. Everyone’s reasons behind their answers were so interesting; it was close to being an even split. A handful of people said they thought the Amsterdam Coalition might be more their speed, which I thought was quite insightful. The group asked sharp questions about the book itself. Of course, I couldn’t answer some for fear of giving away later plot points (such as: What’s going on on land? and Why did I decide to make Simon and Esther Jewish anyway?). One woman asked whether my personal politics influenced the way the communities on the Catalina and the Galaxy Flotilla are portrayed. The short answer is no: it’s all about what works for the story. But each reader brought a different interpretation to what was going on, something that was enlightening for me. We also spent a fair bit of time talking about the publishing industry and why I chose the self-publishing path for this book. (For those who don’t know, I have never submitted Seabound for consideration by an agent or publisher.) I spend a lot of time reading about the industry and it was fun to be able to think out loud for once. I’m grateful to the group for being so enthusiastic about Seabound. It was one of the main highlights of my time in Arizona (a visit that included the birth of my first nephew, my sister’s wedding, and lots of Five Guys, so that’s saying something). I hope there will be more opportunities to visit book clubs in the future! Now that I’m back in the Far East, I’m working on the first revision of the Seabound prequel and preparing to finalize the next draft of Seaswept (Seabound Chronicles Book 2). I also recorded a video of myself reading Chapter 1 of Seabound. If you ever wondered what my voice sounds like or what the buildings outside my apartment look like, here you go! PS. Just a quick reminder that the Seabound ebook is currently exclusive to Amazon and can be read for free on Kindle Unlimited. You can still buy the paperback from BarnesandNoble.com in addition to Amazon!